that deliver powerful digital marketing data. Create Your API Account Now! 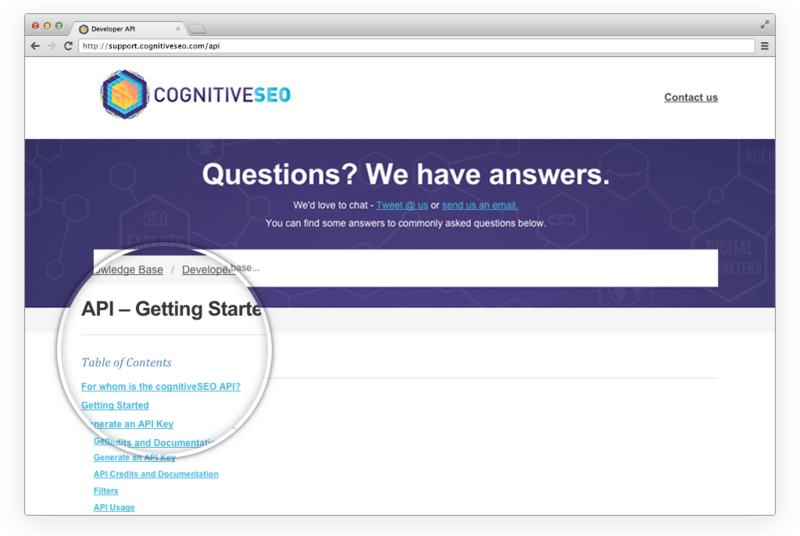 For Whom is the cognitiveSEO API? The SEO API is designed to allow Digital Marketing Agencies, Webmasters and Developers to use the data cognitiveSEO processes in order to integrate them within their own applications or business flows. The API can be used to process all the data that you currently have in your cognitiveSEO account: link analysis, rank tracking and social visibility data, all included. The API is pretty straightforward. All you need to do in order to get started is a valid API key. A detailed documentation is available, containing all the information needed to use the application to its full potential. The API is available for all Premium Subscription users and up. Each subscription type has a number of API credits assigned by default. Should the API Credits limit be reached and you need more credits, you can write us anytime at support@cognitiveseo.com and we will provide you with options to increase your credit limits. The commands in the Campaigns API are also limited by the limits on your subscription. So, if you want to run an analysis on 100 sites and your subscription only allows 50, then you will only be able to add 50 sites using the API. The Campaigns API is used to create campaign and query the data in your cognitiveSEO account. 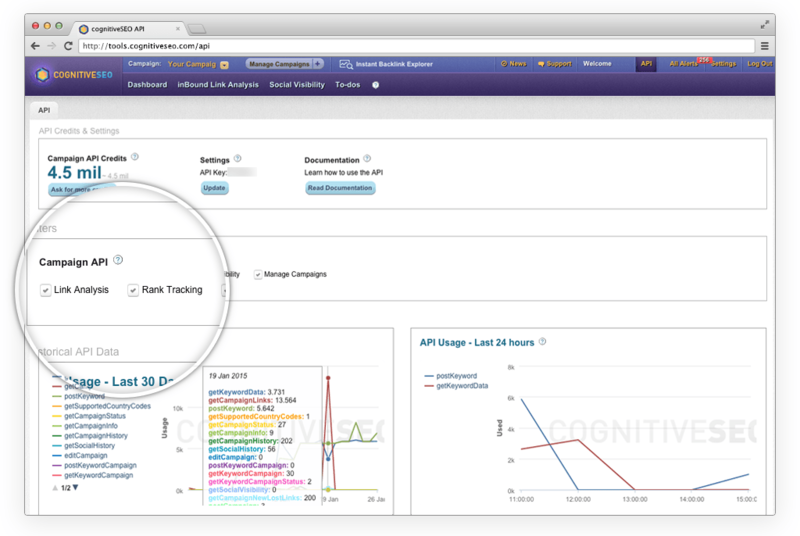 The cognitiveSEO API allows full integration within the applications that you sell or distribute (commercially or freely). In order to share it, we only require an attribution by mentioning the cognitiveSEO brand inside the application (powered by cognitiveSEO). For more information on this, please contact us at support@cognitiveseo.com. You can implement the API in tools or scripts that you use internally. For example: agency scripts/tools that are used to analyze and report the data to clients.